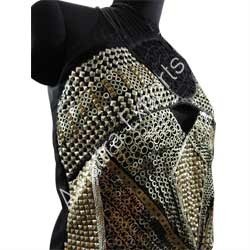 We are engaged in delivering Golden Embroidered Fabrics at clients' premises. The offered range of embroidered fabrics is available in varied designs, shapes, dimensions and specifications to comprehend and meet the assorted demands of valued clients. In addition to this, the offered range of embroidered fabrics is designed in strict conformation with the highest quality norms and standards.